Will or Jon, if you guys want to, can you pin this and delete the old PB Tutorial Sticky I made in Gen Chat? That one's out of date and I made this one for my site and others. Thx. 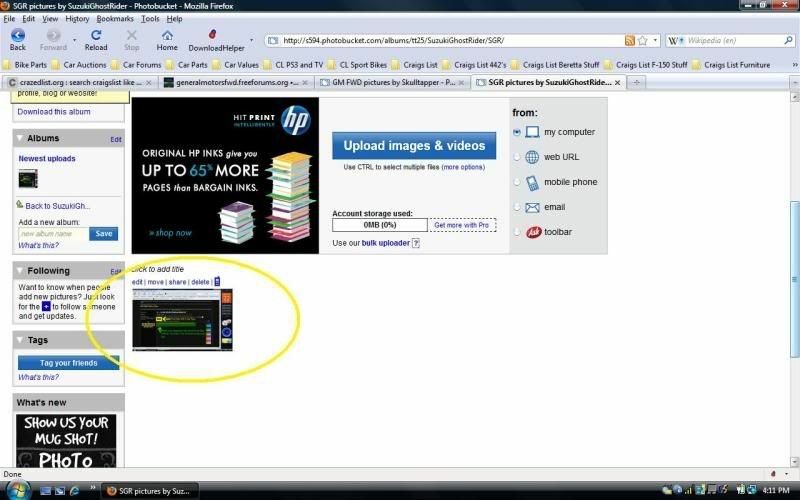 The following will teach you how to sign up for and use Photobucket image and video hosting website. 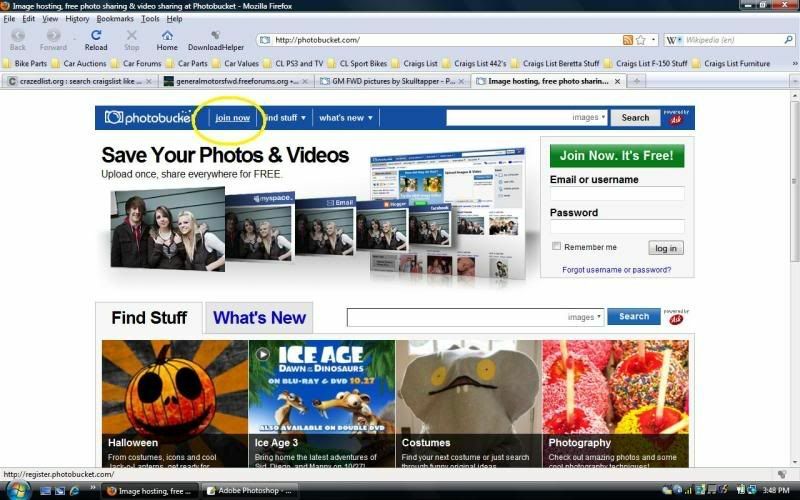 Then you will be able to host images from their site directly to your posts. 1. 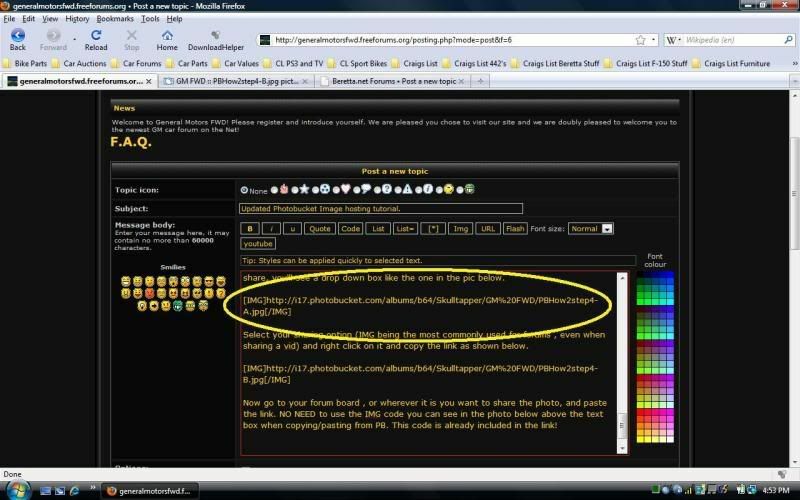 Sign up for PB at http://www.photobucket.com and click on the "Join Now" link highlighted in the pic below. Fill in the necessary information, and in the final step you may be shown an ad offer. Just scroll to the bottom of the page and click on the "pass" button and you will be re-directed to your new PB account page. 2. Now, you've got an account , you're signed in. Now you need to name your first album. You can make as many albums as you wish. 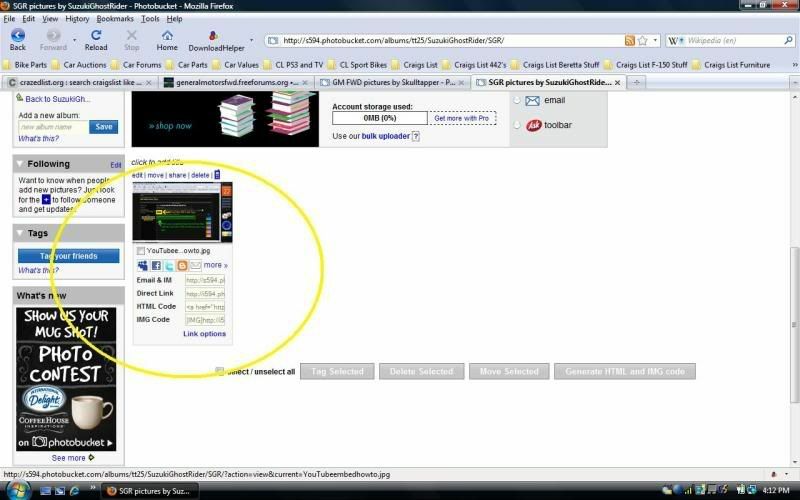 Play around with this as you get more familiar with your PB account. See the photo below for naming your first album. It should be noted, you do not HAVE to create albums. Your default "album" is the same as your username. Albums are just useful to seperate pics/vids of differing natures. Once you've typed in your new album name and clicked "Save" you will be automatically redirected to that album. If ,at any time, you wish to return to the main album you can do so by clicking on it's name link shown in the pic below. 3. Ok, so now that we've named our first album and entered it, let's learn how to upload pics and video to PB. 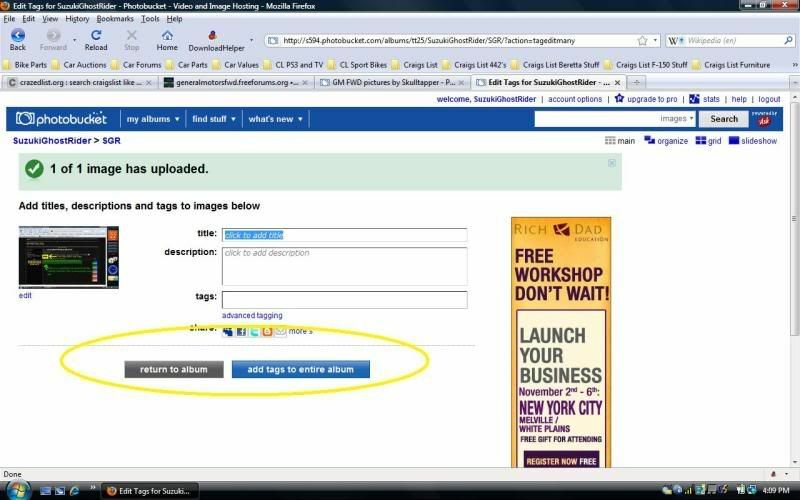 Click on the "Upload images & video" button shown below. This will pull up the file selection screen shown below. 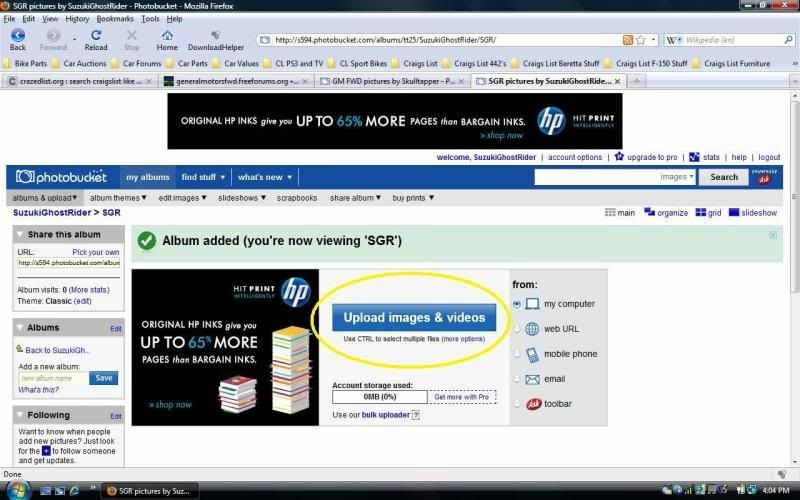 Browse your way to whatever pictures or videos you wish to upload. You may select more than one by holding down "Ctrl" on your keyboard while left clicking on the files you want. Once you have selected your file(s) just click on the "open" button in the file selection window and let PB do it's thing. As your files are uploading you will see a progress bar as pictured below. 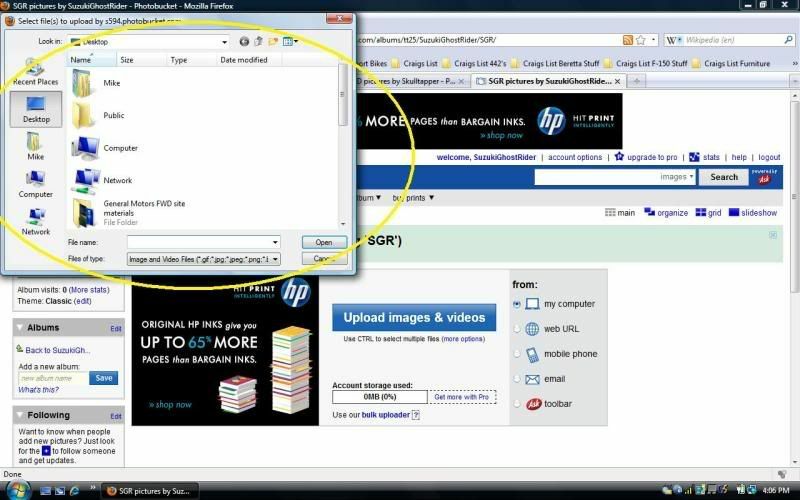 Once your file(s) have been completely uploaded you will see a screen like the image below. At this point you may add "tags" to your files or simply choose to return to the album without adding tags (not required to add them) at all by clicking on the grey "return to album" button as seen in the image below as well. *Note that sometimes a failure of some files to upload may occur. 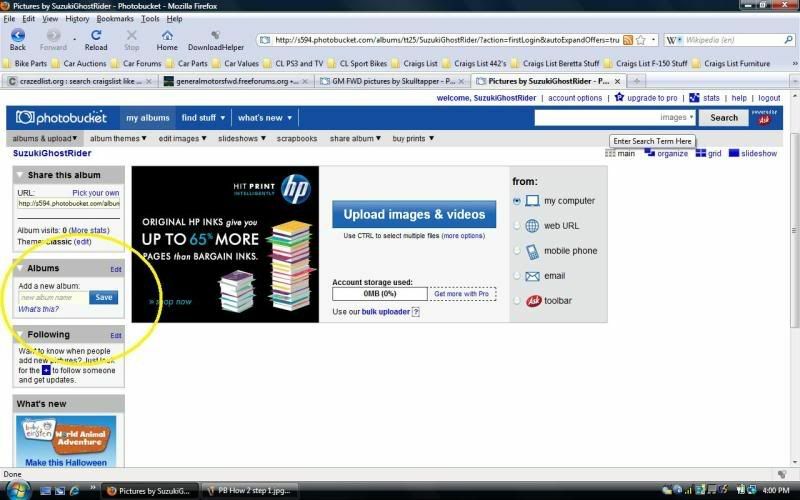 You will see the same window but it will say, for instance "2 out 4 images have uploaded". You will have to determine which ones did NOT upload and re-upload them. Doesn't happen often , but sometimes your ISP may be having issues or PB may be. Be patient, PB is a good site. Now , as you can see in the pic below, your files have successfully been added to your album on PB. Now , we're ready to head to step 4. 4. 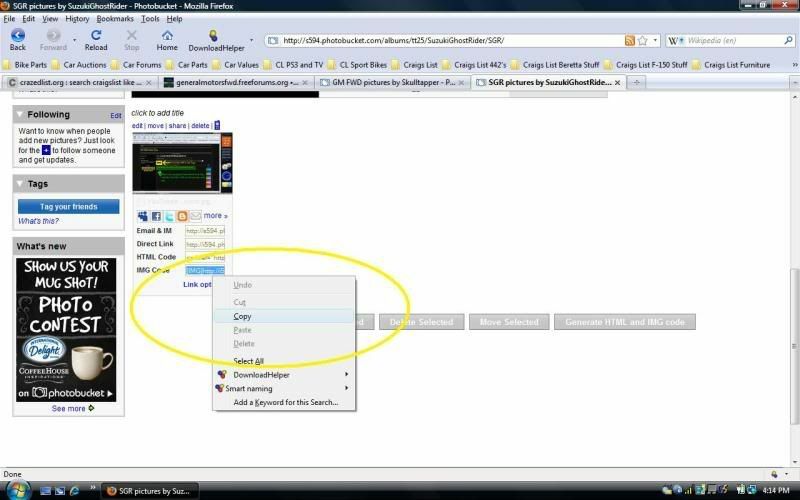 So, now by hovering your mouse cursor over whatever image or vid file you want to share, you'll see a drop down box like the one in the pic below. 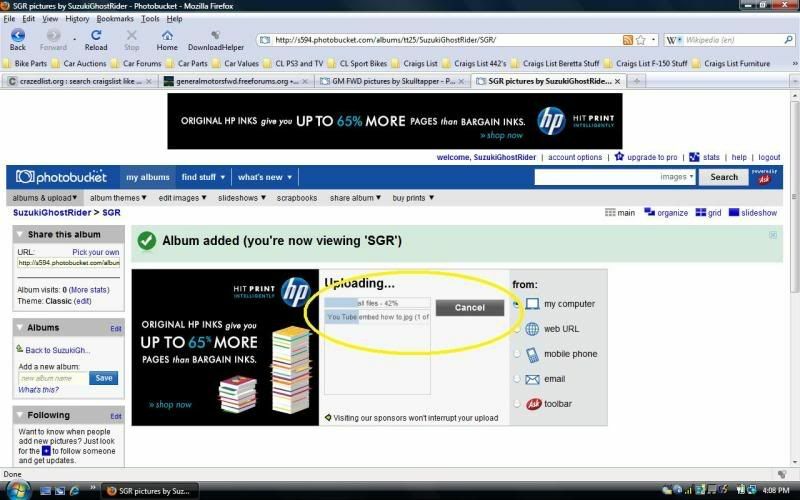 Select your sharing option (IMG being the most commonly used for forums , even when sharing a vid) and right click on it and copy the link as shown below. Now go to your forum board , or wherever it is you want to share the photo, and paste the link. NO NEED to use the IMG code you can see in the photo below above the text box when copying/pasting from PB. This code is already included in the link! The IMG code button is used when copying pics from websites that do not have the IMG code tags already wrapped around them. That's it, you're done! Congratulations, you've just successfully learned how to host images and video to a forum! Dude, seriously? The app should provide this information. Select Photobucket Mobile App On Phone. '94 Quad 4 H.O. 5 speed Z26, Red & Rare! 1 of 896 Quad Z26's and of those it's 1 of 167 red paint/gray interior! Need A Quality Used Part? Contact me at Posihead Auto Parts!